Yep, that’s right about eighty-five bucks for a replacement rubber wheel. The machine takes four of them. If one is bad, you can be all four are about ready to give out. A total replacement cost would be about $335. That’s well over half the cost of the entire machine when it was new. Four cheaply built, poorly constructed wheels cost over half the cost of the machine. They’d probably go bad in another 5 years, if they even lasted that long. Looking at these wheels, they’re nothing special. The bearings are standard $1.50 bearings (sold at the Nordic Track store for $9.50). I can guarantee this wheel could be sold at a profit for around $8, not $85. That’s a 1000% markup for us good loyal nordic track customers. No thank you, this is the last nordic track machine I will ever buy. In search of replacement wheels, I found several sources online. It turns out that inline skate wheels are approximately the same size. Inline skate wheels can be had for $15 or so. The ebayers will often list them for around $30 each as “nordic track replacement wheels”, because they know you’re frustrated from the $85 sticker shock and thirty bucks sounds like a bargain. 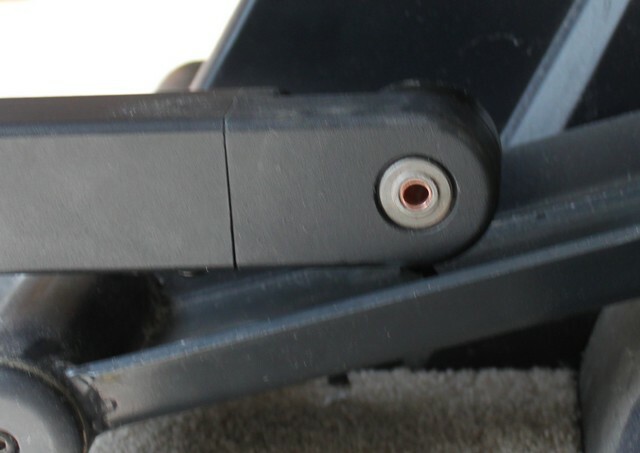 … unfortunately the CX 985 uses bearings that have a 3/8″ inner diameter. 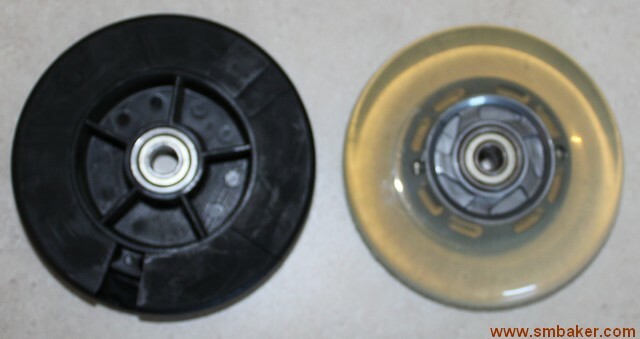 All of the inline skate wheels have 5/16″ inner diameter. You can’t fit a 3/8″ bolt in a 5/16″ hole. This probably isn’t the case for most Nordic Track machines; I seem to be one of the unfortunate consumers who ended up with a machine with the weird size. If you have any question what size yours are, just take the broken wheel to the local hardware store. If a 3/8″ bolt fits in it, it’s 3/8″. If a 5/16″ bolt fits in it, then it’s 5/16″. You can see the nordic track bolt on top, and my bolt and sleeve on the bottom. Note that I would have preferred a grade-8 bolt and probably will substitute one as soon as I can locate one. My local hardware store only had 3″ grade 8s, and I needed a 4″. It looks like a nice little bronze sleeve bearing that I found, doesn’t it? Look at that, total cost was nineteen cents for the bolt, eleven bucks for the pipe (with 9 feet 11 inches left over), thirty bucks for the pair of wheels = $41.19. If I’d bought the wheels from the Nordic Track store, this would have been 167.90, not including the bolt. So far it’s working good with one exception. It squeaks just a little bit. Kinda like there’s an unfortunate cat caught up inside of the mechanism. The squeak is nothing to do with the bearings or the bolt or the pipe, or anything I did, but rather is the side of the wheel rubbing against the the sides of the track. As you can probably tell in the above pictures, the wheels sit just a little bit wider than the original nordic track wheels did and their shape is just a little more rounder than the nordic track wheel, which had a flatter profile. A tiny bit of grease applied to the side of the wheel has stopped the squeaking. We’ll see how long it holds up. Well, that’s all there is. Unfortunately, Nordic Track’s excessive greed in the price of the poor quality rubber wheels has led me to no longer recommend their equipment. Nordic Track elliptical machines are officially on the do-not-buy list. I could understand a 20% markup, or even a 50% markup, but a ONE THOUSAND PERCENT MARKUP is ridiculous. It’s a massive ripoff of the consumer who unfortunately placed his faith in what was supposed to be a quality-built machine. Oh … and just to make things interesting… the inline skate wheels had little LED lights inside of them, so now my elliptical machine lights up at night… unexpected feature? or annoying blinky thing? you decide! Thanks for posting this. I just bought a used CX985 and I have your site bookmarked in case this happens to mine. My CX985 did the same exact thing. One of the wheels just disintegrated. I checked around, and yes, this hard piece of round rubber with a bearing in the middle is $83.00! Looks like I’ll be throwing my Nordic Track in the trash. There’s no way I’m paying that. The mechanism I described on the page of using the inline skate wheels has been working now for several months of regular use. It was a bit of work to do it, but may be worth it to avoid having to throw your machine away. I agree, there’s no reason I’d pay 83 bucks a wheel either (especially considering if one wheel has failed, the other 3 can’t be far behind). Thanks for the post. I have the CX 995 and the same thing happened to my wheel. I have been lucky enough to have had it last 8 years with pretty consistent use. I ordered the wheels on line from the manufacture and received the “wheel” in the mail. On the Icon Health and Fitness web site it says under quantity “4″ so I was under the assumption that I would receive 4. I just got off the phone with c.s. and they told me that my assumption was wrong. The quantity of “4″ is what my machine came with but $85.00 gets you only 1 replacement wheel. I am returning the parts I ordered tomorrow. I just typed in “eliptical machine wheels” and got your page. I will be doing the same thing you did tomorrow. Same thing happened to our CX 985. My wife uses the machine twice a day, and would go nuts with out it. Mine has the (bigger) 3/8′ bolt too. I did order replacement wheels off of eBay and the inner bearings were too small; the same problem you describe above. I tried your fix without the copper sleeve around the new 5/16 bolt and the machine is working fine for today with no sloppy movement in the wheels. Bought a 5/16 bolt and washer at the Home Depot and the cost of 2 wheels from eBay added to just under $60.00. Thanks for this post, as it made the decision to go forward with this home repair, rather then ordering Nordic Tracks overpriced wheels. My wheels are fine but the large wheels in back have developed a lot of slop. What I mean is instead of the bolts being solid it is worn and can wiggle back and forth and it gets quite noisy. Tried to remove the pin (?) that holds it to the large wheel and couldn’t get it out to see what it would take to replace. Anyone have this problem and or a solution? Thanks for the post, Scott! I too have a CX985, only I was a sucker and bought it new from NordicTrack when it was $1100. Mine has been in constant use (at least 3x/week for 10 or 11 years for at least an hour or two at a time) and developed the same cracked wheel as yours (though, it felt like I had a flat, so I pulled over and pulled the wheel off before it totally cracked all the way thru, heh.) You’ll be glad to know they’re no longer selling these horrid little wheels at a 1000% markup. They don’t even recognize the model number on the machine…possibly they want to forget it, or sell us all a new one, hahahah! keep dreaming NordicTrack! So, I’m going to start there, and deal with the sleeve/bolt/bearing issues when the wheel arrives. Thanks for the info! The same thing happened to my cx990. Icon fitness wanted $103 for a replacement! After a lot of research, including this page, I found that I could order razor scooter replacement wheels at $10 for a set of two. They are 98 mm instead of 100, but they work great and completely fixed our machine! I just replaced two wheels on my CX985. The copper pipe is a creative fix but entirely unnecessary. I bought Razor scooter replacement wheels on ebay for $10 (100mm). The inner part of the bearings were different sizes but the outside was the same. Basically, the bearings are interchangeable. There are two bearings per wheel. Stick a skinny screwdriver between the two bearings, hit it with a hammer and they will pop right out. Switch the bearings and use a rubber mallet to force them back into place. I wish someone would have told me this because you can get replacement wheels without bearings for $4 on ebay. OMG I’m so glad I came across this site! I am NOT paying $85 for a freaking wheel. I don’t know how to do anything involving tools and bearings and what not so i’m going to have to find a guy to do it for me. But thank god you posted this! Thank you! Thank you so much. Just like the others my CX985 wheel did the same thing (looks just like your photo) And same thing ICON wanted $80 something for 1 wheel, which I am not paying. And thank you Dan for you post that sounds even better. You would think that NordicTrack would do better by there costumers. I to will never recommend them to any one again. Thanks again. I am so glad I found this website – the Razor Scooter wheels worked perfectly! I was absolutely livid when the package containing my “wheels” showed up with only one wheel – you’d think they’d learn by now since clearly many of us had the same issue. The wheels I ordered are: http://www.amazon.com/gp/product/B005UQV9AO/ref=oh_details_o00_s00_i00 – four of them plus S&H cost me $24 and they arrived in about 2 days. I popped out the bearings on the old wheels, popped them into the new ones and they work perfectly. They were somewhat squeaky but I found WD40 took care of that and they glide seamlessly. 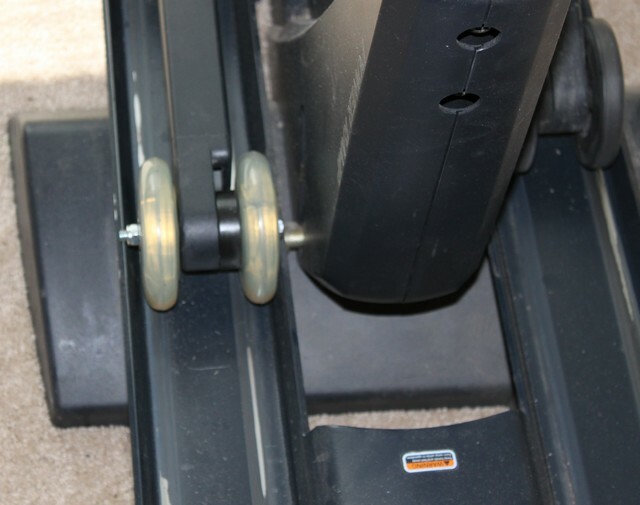 So glad to have my elliptical back and grateful to have found this site – thanks to everyone who posted solutions! Replaced all 4 of my wheels with some Razor wheels from Academy. Couldn’t find any copper tubing that had the correct inner diameter. Found brass compression sleeves that had the correct inner and outer similar to these http://www.homedepot.com/p/Watts-3-8-in-Brass-Compression-Sleeve-A-102/100637733 You’ll need to hammer them in pretty good to get them to stay put, but work great so far. Thanks for this write up!! Great instructions…a little follow up…If you buy Scooter replacement wheels (98 mm) with a spoked hub, you can actually removed the bearings that come with them and pop the bearings out of the old nordic track wheels and putt the 10 mm bearings in the new Scooter wheels. A slight tap with a rubber mallet is all that it took (Spacer and all). Didn’t have to mess with a new bolt or anything…and it appears the 98mm scooter wheels (although still wider then the original nordic track wheels) are narrower then roller blade wheels so they fit in the track with a few millimeters of play…. I had the same problem. I ordered 100mm wheels on ebay and paid $11.95 for 2 with shipping. 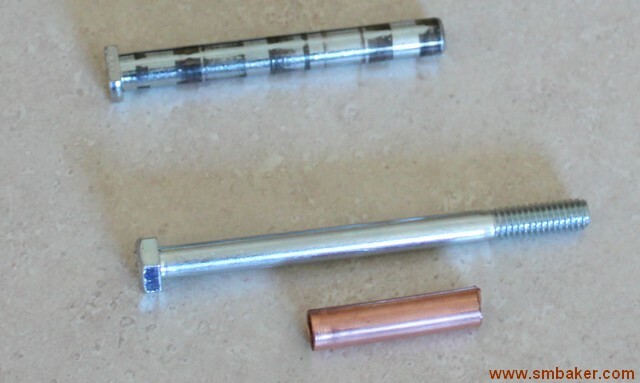 I paid $3.49 for 1′ of 5/8″ copper tubing and $.95 fro a 4″ 5/8″ bolt. I had to put the typing in a vice and ream it with a 5/16″ drill and then spin the pipe to sand the outside until it fit snugly in the machine. It took about 15 minutes and I saved $70.00. I addition I replace 2 wheels because I am sure that the same thing will happen to the others. Wow. I had exactly the same problem and drew exactly the same conclusions, although I was hoping to buy a sleeve of some sort. Maybe I’ll get lucky and find one, if not I’ll go the copper tube route. Just for giggles, you should check out all of the parts prices – It would probably cost you $20K to build a machine from scratch. The rear flywheel? $900. Also, I recommend using silicone spray rather than petroleum based lube, as it will eventually eat the wheel. Also, silicone doesn’t attract dust. I have a CX995 that I bought used a few years ago and have used it extensively since with no problems, until last week. Sudden things got bumpy as one of the wheels broke into pieces. I hadn’t even noticed they were worn out but the others were cracked as well. I was shocked to see the high prices for 1 wheel alone and thought I was going to be shopping for a new machine until I came across this page. I purchased 2 sets of Razor wheels for $20 on Amazon…put the old bearings into the new wheels and everything went back together perfectly. Thanks to the OP and everyone that contributed to this page! I just came down with the same issues with the ramp wheels for my Nordic Track CX995. Can anyone explain how to remove the wheel from bolt holding the wheels together? The bolt head has an oval shape on both sides. Do I need special tools? I have a cx985. I was shocked the price for a wheel was $81. Thanks to this website I did it for free. My kid’s scooter wheel was a perfect fit. 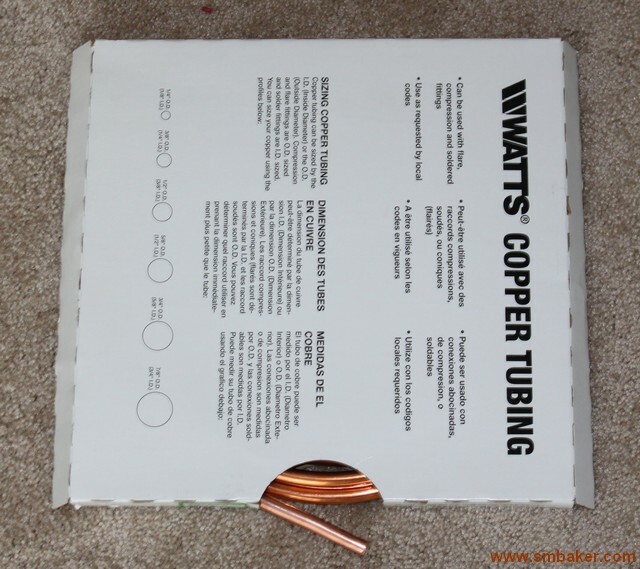 I did not need to purchase any materials or use the copper tubing idea. 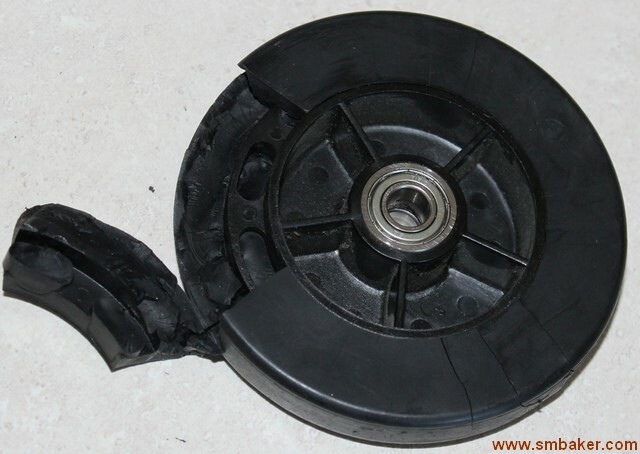 If you are careful removing the original spacers and bearings from the broken wheel, they can be inserted with a rubber mallet into the new wheel which have a slightly smaller inner diameter. I have a bent screwdriver which allowed me to use it as a hook and pull the original fittings out. Hope this helps. F… Nordic track for price gouging. I am so happy I found this site! I too bought 4 wheels on Amazon for less than $15 total. I removed the bearings from the Nordic track wheels and put them in the new razor wheels. Took no time at all and my elliptical works like a dream again! I actually think the razor wheels will last longer than those plastic nordic track wheels anyways! I didn’t even have to swap out the bearings. For the CX-990 they are already the same size as those on the Razor Scooter wheels. Good deal! For the CX-985, as noted by another commenter, it was super simple to swap out the bearings from the old broken wheels to new Razor scooter wheels. No copper wire or new bolts required. I’m so happy I found your site and have saved a bunch of money.